The trouble with eschewing is that there’s no way to know when to stop. I posted on Tuesday. On Wednesday I eschewed. I continued eschewing on Thursday, Friday, and Saturday. Now it’s Sunday, a half-hour before I should retire. Thirty minutes isn’t enough time to finish this. I may eschew by necessity. Tomorrow an’ tomorrow an’ tomorrow. How slow dey movink! Almost cripps! Soch a pity de pace! Forgive me. I’ve been wanting to quote Hyman Kaplan for years. But you get my drift. What if eschewing does not end? More than once this week, I pulled up the New Post screen and began to write. But you know how that works. Three- or four hundred words in, you stop and skim over what you’ve done. You realize it stinks. You forget that everything you write starts out the same way–stinky–and that if you persevere, cut it by about half, rewrite what’s left, you can get the reeking to cease, mostly. At least that’s the way it works for me. But it works that way, obviously, only when I’m in practice. Go without writing for several days, and what happens? The connection between the brain and the hand weakens. The personal lexicon diffuses. Words spring loose, leak in to the spinal fluid, slog through the lymphatic system, and end up stuck somewhere near the tip of the tongue. More than once this week, I scrapped what I’d written. That cannot continue. If I’m going to blog, I must set aside public opinion and the slings and arrows of outrageous critics, and, as my husband would say, put my nose to the brimstone, and blog. I’ll stop now before this gets any worse. Quotations from Julius Scissor (or, possibly, from Macbeth) are taken from “Mr. Kaplan and Shakespeare,” in The Education of Hyman Kaplan, by Leo Rosten. 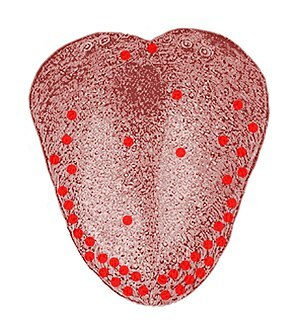 Image of the tongue: This faithful reproduction of a lithograph plate from Gray’s Anatomy, a two-dimensional work of art, is not copyrightable in the U.S. as per Bridgeman Art Library v. Corel Corp.; the same is also true in many other countries, including Germany. Unless stated otherwise, it is from the 20th U.S. edition of Gray’s Anatomy of the Human Body, originally published in 1918 and therefore lapsed into the public domain. I have been fiddling with the preceding 420 words for the past 2.5 hours. That includes the 30 minutes I gave myself to write it. Lesson: Nocturnal individuals should leave blogging to the daytimers. Please, it’s obvious that you have something to say and the ability to say it well. Continue to spread the inspiration. I, for one, have missed reading it over the last few days. Thank you. I’ve missed writing it. Ah, so true, Kathy, so true. We are like circus people spinning plates: running from life to writing to life to writing…. That’s it exactly. And lately my plates have been flying off in all directions. Such beautiful eloquence in describing non-eloquence!! Dear, dear: anyone who writes, “Go without writing for several days, and what happens? The connection between the brain and the hand weakens. The personal lexicon diffuses. Words spring loose, leak in to the spinal fluid, slog through the lymphatic system, and end up stuck somewhere near the tip of the tongue,” is in no danger of losing anything, you writerly wizard, you. Thank you so much! It’s lovely to be called a wizard, especially a writerly one. The secret is that I know so much about non-eloquence–it’s sort of like having inside information. PS: I LOVE THIS BLOG!! Who else dares to tell the truth? That PS is one of the NICEST things anyone has ever said to me. I just copied the sentence in big letters onto a sticky-note and affixed it to the upper left corner of my monitor. It’s the best possible lifeline, and I thank you for it. As for the truth…that’s an idea for another post. Keep eschewing. It makes for a very thoughtful blog. I connected with it. We daytime bloggers need to hear this. We have our eschewing moments as well but are not usually brave enough to voice the thoughts. I have a feeling that most of your eschewing happens when you’re in search of material to blog about. I envy your journalistic discipline and your ability to recognize a topic when you see it. And to go looking for it in the first place. Thank you SO much for not stopping before you got to “nose to the brimstone.” That just made my day. I’m glad you like it. I don’t know what they’re called–portmanteau cliches?–but I’ve learned several such figures of speech since I met David.